After several years of support for T4, tangible engineering now has its own IntelliSense aware Editor for T4 that helps you create custom code generators baesd on your models, xml or DB-files. 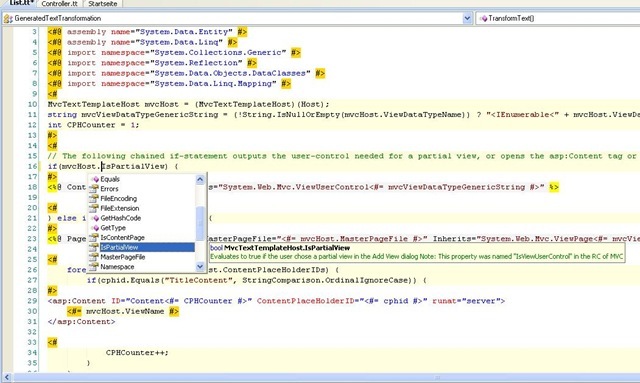 With tangible's T4 Editor you can author your own Code Generator via Text-Templates (TT-Files) with IntelliSense, Syntax-Highlighting. T4 is a Microsoft Language for writing Code Generators which is similar to ASP.NET and is used by the Microsoft internally to build software and new features for .NET 4.0. The T4 Code Generation Engine is already built into Visual Studio - so the only thing that was missing is a good Editor and some free UML-style modeling tools.. so we shipped it. Now it is up to you to accelerate your projects and start saving your company money by adopting T4 today and generate the code you need directly form diagrams, database schemas or xml files.